Water conservation educational rap song. Toothbrush and packaging are 100% biodegradable and printed with soy ink. EcoFly - Environmentally friendly timer toothbrush with a water conservation educational rap song. Toothbrush and packaging are 100% biodegradable. Comes in: Forest Green and Ocean Blue. 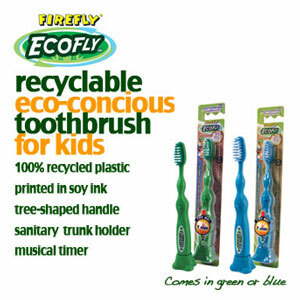 Introducing the EcoFly™ toothbrush from Dr. Fresh, the first "rappin" , recyclable, eco-concious toothbrush for kids. Musical timer featuring an original rap song recorded by "Da Hip Hop Cop." aka Anthony Ward, teaches kids to brush to long enough to keep smiles healthy, but to conserve water in the process by turning off the tap.